I can’t tell you how many people have recommended this book to me and for good reason. A panster at heart, I found my story floundering and myself stuck around the 40,000-word mark. 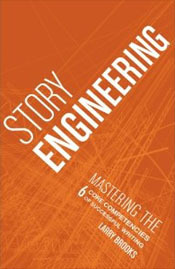 Already an ardent follower of Larry Brooks blog, Storyfix, I downloaded Story Engineering and dug in. This book is by far one of the most comprehensive books on story structure I’ve read to date. Full of helpful how-to’s and thorough examples, Larry teaches you how to structure and outline a story before you write the first word. From the six core competencies, necessary for every story, a list of detailed questions, and clear examples from popular movies and books, Larry takes you through the process for writing a successful and publishable novel. This book is one of those every writer needs in their library collection. It is one you will refer to again and again. I agree with the bookshelf and the muse. He has another book, Stuck in the Middle, I haven’t completed it yet, but since that’s where I’m stuck on my current WIP, I should get to reading. Thanks for stopping by the Cow Pasture and commenting.